The wonderful weather we have been experiencing over the past few weeks (thirsty plants notwithstanding) has meant we’ve actually enjoyed a few meals outside this year. Eating food outside always seems to taste so much better somehow, I don’t know whether it’s all in the mind or if our senses are energised by the fresh air and sunshine. Outdoor meals for us have mostly been with friends as our garden is a little on the small side and not really suitable for outdoor eating. I keep thinking I must plan a tea party down at our plot, but the best I have managed so far was to have a take away supper down there. Our latest meal was a BBQ eaten out in a garden surrounded by flowers, fields and views. I had just read about Strawberry and Clotted Cream Shortcakes at Clotted Cream Diaries, which I really liked the sound of. This reminded me of the delicious Chocolate and Cinnamon Shortbread that I made back in May last year. Marrying these two things together, I took along chocolate cardamom shortbread, strawberries in a little cardamom, rose and mint syrup and clotted cream for pudding. I based this recipe on the cinnamon one, substituting the semolina for polenta and the cinnamon for cardamom. Sifted in 20g cocoa, 60g polenta, 170g plain flour, a pinch of salt and the ground seeds from 6 cardamom pods. Formed this into a ball with my hands and rolled out to about 1/2 cm thick then cut into rounds. I wasn’t expecting this mixture to spread so placed the rounds quite closely together on a lined baking sheet. They spread, so I didn’t get perfect rounds! Baked at 180C for 8 mins. Left to cool slightly then transferred onto a wire rack to cool completely. Although the recipe was virtually the same as the cinnamon squares I had previously made, these were completely different, but equally delicious. 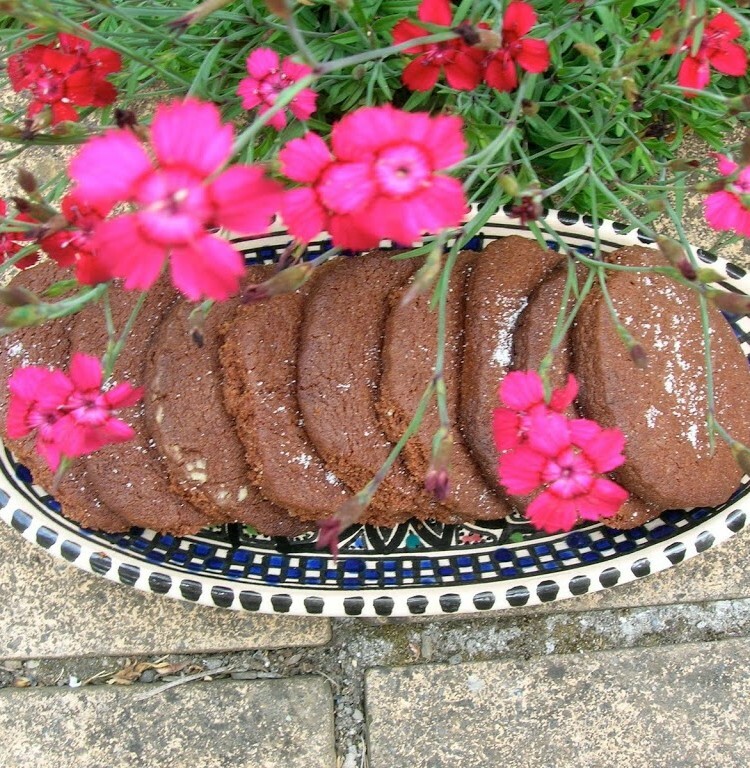 Last year’s version was deep and soft in the centre, these ones were like biscuits and had a lovely crunchy texture. The cardamom gave a really intriguing exotic twist which went well with the strawberries. The clotted cream made it into a virtually unbeatable outdoor desert! They sound really innovative- I love spiced chocolate! how would you describe shortbread to someone who has no idea what it is? That sounds like the perfect dessert to me – I haven’t ever tasted cardamom and chocolate together, but am really looking forward to doing so now!!! these look wonderful… always dubious about the addition of polenta… do you think it really makes a difference? I guess I must try them and then i’ll know..
Choclette, what a fascinating combination – cardamom and chocolate! They look wickedly good – like grown up strawberry shortcakes..
Oh yummy! I do like cardamon. apparently Nigella puts it in chilli. I imagine it works really well with the chocolate too. Mmmm, they look delicious. My mouth is watering at the sight of that – chocolate, strawberries and clotted cream. Chele – I’ve got to organise it first – that seems to be the biggest problem! Made2Order – well it’s a bit difficult to describe. I’d say it was a type of biscuit, but Americans mean something different when they talk about biscuits. It’s not really a cookie exactly. It’s definitely not cake. It is very nice. Chocolate is an unusual addition. Normally it’s just butter, sugar and flour. BVG – I’ve made a cake and cupcakes with chocolate and cardamom and both of those were really good. Dominic – In cakes, it definitely makes a difference giving a slightly crunchy texture which I quite like. In this, I’m not sure. These were definitely crunchier than the batch I made with semolina, but they are a lot thinner. Celia – definitely grown up – not recommended for those with a really sweet tooth. Helen – I am a bit of a cardamom fan, but have only started using it with chocolate in the last year. Kath – you can’t really beat strawberries and cream at this time of year can you? Yum! Choclette – I wanted to ask if you’ve tried the Riverford Farm Recipe for Chocolate and Courgette Cake? I have loads of courgettes in the garden and want to try it, but don’t want to waste good chocolate on something that’s a gimmick – I thought you would be the person to ask, oh chocolate guru! Kate – I have made a courgette cake without the chocolate which was really good. Not so much for the flavour but for the moistness and texture. It’s another way to use up courgettes if your growing them yourself, but I don’t think I’d bother buying them specially for this. I was planning on making a chocolate version this year though, so thanks for the link. They sound really lovely, and they look gorgeous too. I love cardamom and chocolate together as well, but wasn’t so sure when I made one of the recipes out of the “Adventures in Chocolate” cookbook… have you had a look at the Choc Ginger Cardamom Tea Cake? CityHippy – thank you for reminding me of Paul’s book – it seems to have got buried under a pile of debris. I shall fish it out and get re-inspired. What was wrong with the tea cake? Lovely looking shortbread! Further to your comment on my blog, I use photoshop for cropping, resizing and adding the watermark to my pictures. Nothing fancy! This is a wonderful post – beautiful photos, lovely recipe – these look delicious! I’m not sure what was wrong with the teacake. It was tasty, just not delicious, will probably put a post up on it in a few days. If you feel inspired, I’d love to know what your take on it is. FoodyCat – Photoshop sounds quite fancy enough, but thanks for info. Have been thinking I ought to watermark my photos, just not sure how. Lucie – you do say such nice things – thank you. CityHippy – I will give it a go and let you know (might take a while). Maybe it’s more a book to inspire food dreams rather than to actually use. Choclette, I went to two supermarkets today and neither had cardamom. Ahhh I want to be back in the city!!! Chocolate makes everything better! Great combo of flavors there. Gillian – you don’t really you don’t – do you? Thank you Judy – it certainly helps oil life’s wheels. Nic – are you off wheat and sugar for specific health reasons? There certainly isn’t a great deal of sugar in these and I guess you could substitute other flours for the wheat. I instantly loved the shortbread, but when I saw you had topped it with clotted cream and strawberries, well I was very excited indeed. Chocolate and Cardamom, always a great combination! Jac, yes not sure what I like best really – stawberries and cream with shortbread or with scones or with merangues or in cake or ….! Oxslip – cardamom is a particular favourite. Like cinnamon, it goes so well with both sweet and savoury. This looks like a great recipe! and possibly even one I might be able to make!